Post colonialism has been there too long in the market and has probably become a cliche,hence the term exotic hardly applies. When one through fiction,is transported into a different locale with its cultural codes,religious ideologies governing a unfamiliar society one is likely to think of the word exotic. The superficial layer seems exotic nevertheless as one digs deeper one is mystified by the truth. Faces of War ,fanatic patriotism and brutality appear the same in a Pamouk ,Keneally or Nadeem Aslam’s The Wasted Vigil. Diaspora is just a tag. The native Asian writer who disturbedly witnesses ‘the fraying of the cultural fabric’ and writes about the emergence of new trends,that are alien , enquires just as any writer would about the dynamics of society. Huggan’s idea is too pessimistic, disenchanted even. Readers get stuck into Indian or Nigerian novels because they want a sense of what it might be like to be Indian or Nigerian; they project their sympathies in an act of identification that’s obviously fictive and has its limits but is better-intentioned than his dynamic of ‘exoticisation’ allows. His book seems to be taking an exception to the nineteenth-century George Eliot idea of liberal sympathy, but I think her tradition (of why we read, why we experience empathically through the novel) still has legs. 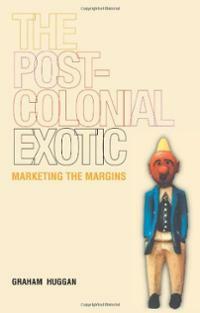 The discussion doesn’t say anything about whether postcolonial novelists ‘exoticise’, or are complicit in exoticisation, but very often they seems at pains not to. A very common mode of postcolonial fiction is realism, the form par excellence of enlarging readerly sympathy. Many novels like e.g. Mistry’s _A Fine Balance_ couch themselves as realism when their matter might be more naturally suited to farce or satire. Gail Low’s Publishing the Postcolonial is also worth looking at if we want to think more about the publishing contexts of literary histories of the postcolonial novel. And on a related note, this is a reprint of Gish Jen’s ‘Who’s to Judge’, from The New Republic, April 21, 1997 – http://www.giarts.org/article/whos-judge 0n the ‘backlash against multiculturalism-as-publishing-phenomenon’. Good article, with relevance well beyond the literary sphere.